Fantastic stuff! I've just read the whole thread. On a less intellectual level, after starting secondary school, I was playing with some of my new pals in what was then (I think) Provanmill Park. Where there is now the water feature there was just a burn disappearing underground. I was told that it was the Molly and that if I jumped in, I would come out at St. Kentigerns. I'm glad I didn't try. 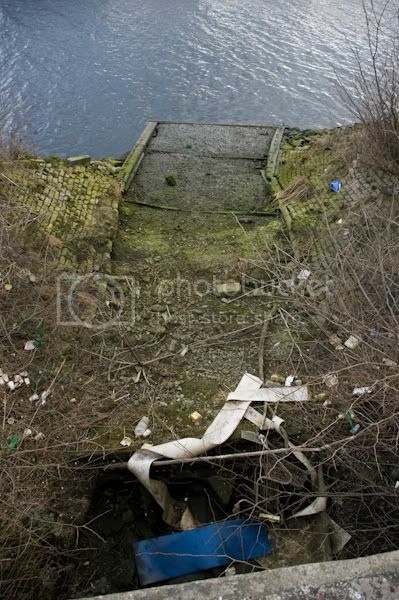 I don't recall seeing any photos of the Molendinar's outfall to the Clyde when I've read this thread in the past so here it is. If you look closely at the background of the above photo you can just make out the original outfall next to the High Court. I came across this 1832 plan on the NLS website. Glesga_Steve wrote: I don't recall seeing any photos of the Molendinar's outfall to the Clyde when I've read this thread in the past so here it is. It's there to collect the gold teeth that get punched out up on Duke St. This is maybe my favourite thread. 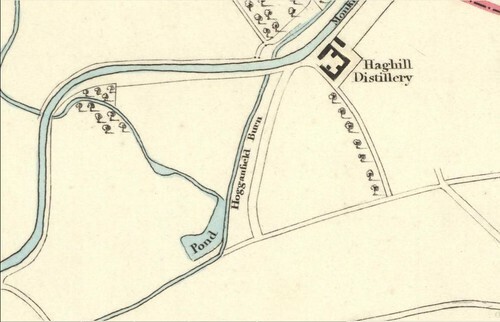 Interesting stuff on the Molly, the "cut" between Hogganfield Loch and the Cam Loch (now Frankfield Loch) was dug in 1675 and the natural outlet of the Cam Loch towards the Luggie, was blocked up. The Town Council had purchased the Provan from Hamilton of Silvertonhill in 1667. The Hamilton's had obtained the Provan by marriage to a Baillie heiress, that family managed to get title to the land having been the prebend of Provan before the Reformation. 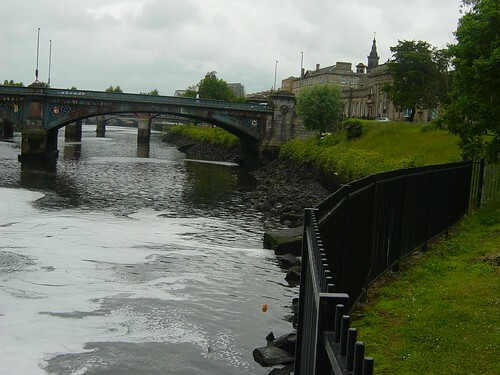 The Hamilton's were billing the Town Council for the use of water from Hogganfield to power the mills on the Molindinar, so the aquisition of the Provan was partly to secure the water rights. Digging the "cut" between the two lochs was to improve water volume during Summer drought. Deepening the "cut" further was carried out in 1729. There has been no water from Hogganfield Loch going into the Molendinar for a few weeks, the sluice has been closed and the loch now filling after the current improvements, yet passing the burn at the side of the former Great Eastern Hotel today I note there is a good flow of water in it. Given that there's been no rain for yonks filling the gutters, from whence cometh the deluge? The new railed deck at the loch pier is superb, by the way, reminiscent of the stern of a Clyde steamer! Would I be right in saying that this waterway in Moledinar Park is the only instance of the Molendinar above ground now? Huggy wrote: There has been no water from Hogganfield Loch going into the Molendinar for a few weeks, the sluice has been closed and the loch now filling after the current improvements, yet passing the burn at the side of the former Great Eastern Hotel today I note there is a good flow of water in it. Given that there's been no rain for yonks filling the gutters, from whence cometh the deluge? The new railed deck at the loch pier is superb, by the way, reminiscent of the stern of a Clyde steamer! For the most part, any flow over the last week or two (i.e. over the recent period of sunny/dry/warm weather we've had - until today that is!) is probably down to infiltration into the culverted sections. 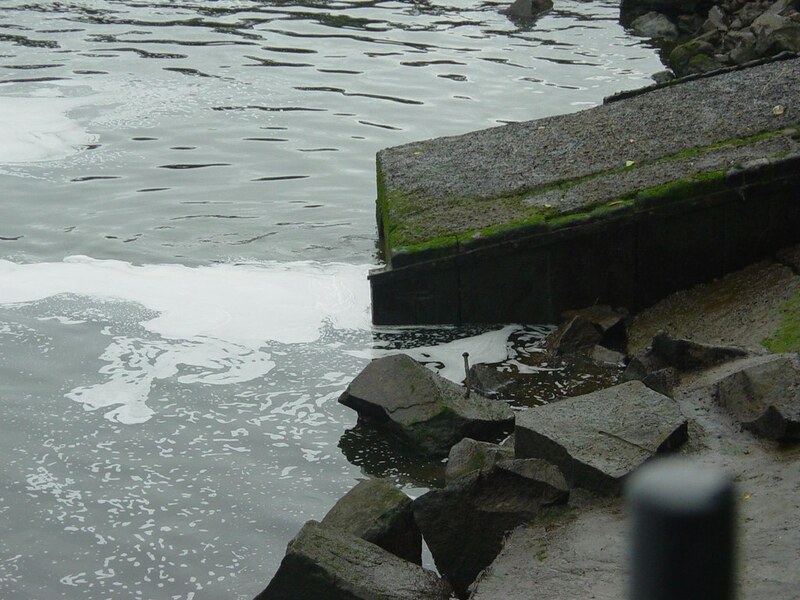 You'd probably be surprised at how big a proportion of flow in drains, sewers and culverts is down to infiltration. Gary Brown wrote: Would I be right in saying that this waterway in Moledinar Park is the only instance of the Molendinar above ground now? Only if you ignore the (most-commonly referred to part on HG) short section at the Great Eastern and the stretch through Riddrie Park Cemetery. 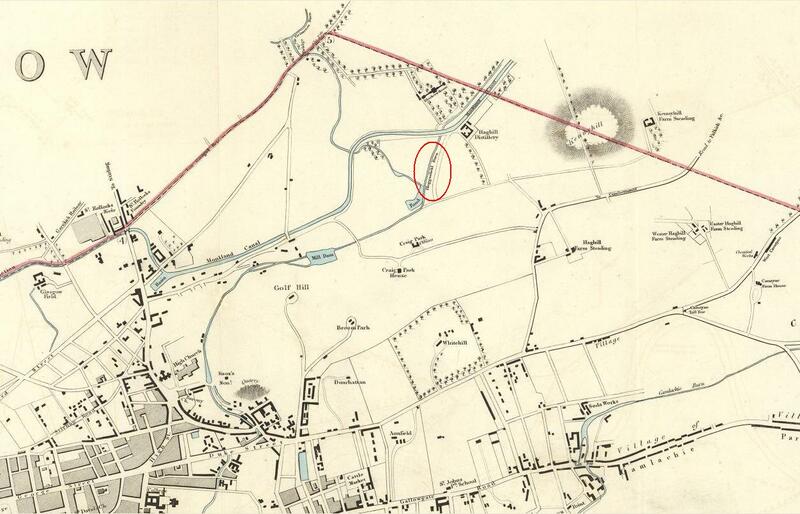 Re' the Molendinar visible above ground, the stretch between the Frankfield Loch & Hogganfield Loch is referred to on the maps as the Molendinar, but was only cut in the 1670s to suppliment the flow for the town mills. The first sluice on the Hogganfield was built in the 1400s with the building of the first mill. The last mill, Provan Mill, closed in 1905, the site of the wee park in the pic's, with the obligatory traffic cone! Huggy wrote: Re' the Molendinar visible above ground, the stretch between the Frankfield Loch & Hogganfield Loch is referred to on the maps as the Molendinar, but was only cut in the 1670s to suppliment the flow for the town mills. The first sluice on the Hogganfield was built in the 1400s with the building of the first mill. The last mill, Provan Mill, closed in 1905, the site of the wee park in the pic's, with the obligatory traffic cone! 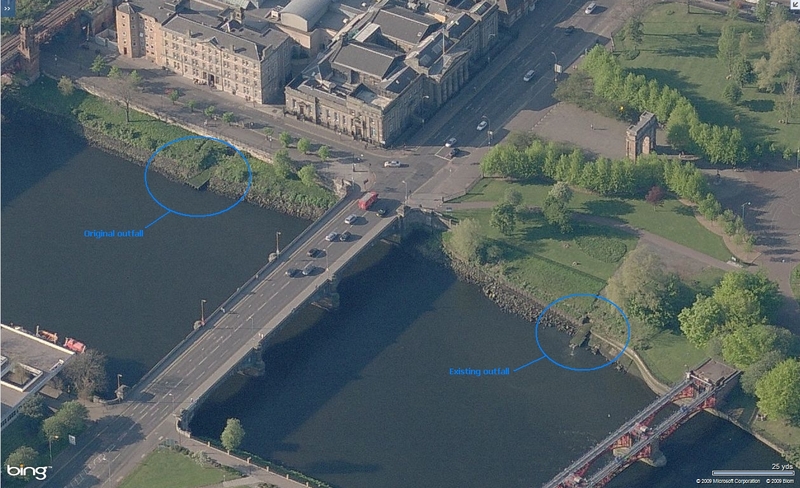 If I remember correctly, flows in the 'ditch' between the two lochs can't reach Hogganfield by gravity alone. I'm pretty sure there is an Archimedes screw on the east side of Avenue End Road. Steve, there are two pumps which assist the flow when the burn level tips a float when flooded, there's also an overflow to the east , under the new causeway, which presumably runs to its original course, the Garnkirk Burn. This causeway carrying the road into the new housing development and laid on deep peat, is collapsing. Huggy. Interestingly, I grew up under the misapprehension that the Molendinar ran through Carntyne at points, and down to the Clyde much further east. There was a burn alongside the old Dalriada motel, which we were always told was the Moley, and also the local tale goes that flooding in the "new" housing estate on Hogarth Park was down to the burn being culverted under the Parklands development. So my question is, could the burn by the Dalriada be Camlachie Burn? Or something different all together? It's hard to get perspective on the old maps, because so little is on there which is recognisable (and often the maps don't go out as far as Carntyne/Cranhill on account of there being bu88er all out there at that point!). Does anyone have any theories? The burn that runs past the former site of the Dalriada is neither the Molendinar nor the Camlachie - it's the Light Burn.